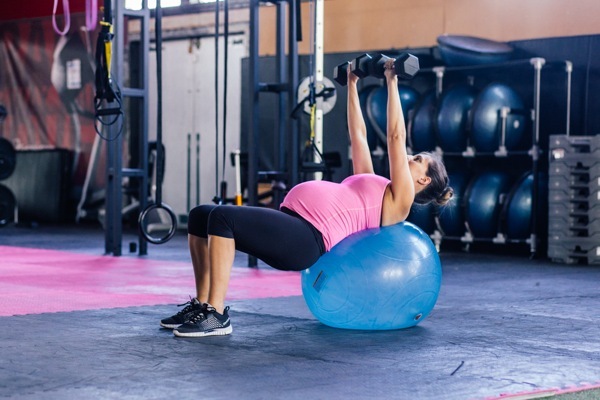 can you work out on your back during pregnancy? Before I get into this post, I want to give a friendly reminder to listen to your doctors and midwives, and also listen to your body. Each pregnancy and experience is so different, which makes it important to verify recommendations with your medical professions. When I was pregnant with Liv, I freaked out every time I woke up accidentally lying on my back. I frantically recounted the nighttime back-lying horrors to my midwife, and she shared some wise words of reassurance: “You’ll feel it before the baby does. If you wake up, your body is just reminding you to roll to the side.” It gave me some peace of mind, and was something I remembered during my pregnancy with P. Despite my best efforts and pillow sandwiching myself to remain on my side, if I woke up on my back, it was just a reminder to roll back to my side (which was an Olympic event considering the giant baby I was growing haha. I had the hardest time moving around during the night!). Now what about exercise? Do you need to avoid any exercises on your back for the entire 2nd and 3rd trimesters? The short answer: YES. The longer answer: yes, but there are so many things you can do instead. You probably won’t even miss working out on your back. First let’s talk about why ACOG recommends skipping exercises on your back following 13 weeks of pregnancy. The supine position can cause compression on the inferior vena cava, which is a large vein that carries deoxygenated blood from the lower and middle body to the right atrium of the heart. If you’re on your back, the pressure of the baby can compress this vein and reduce oxygen to the fetus. You may start to feel this, and feel uncomfortable, hot, and/or dizzy. This was more prevalent during my second pregnancy, and I think it’s because P was so much heavier. 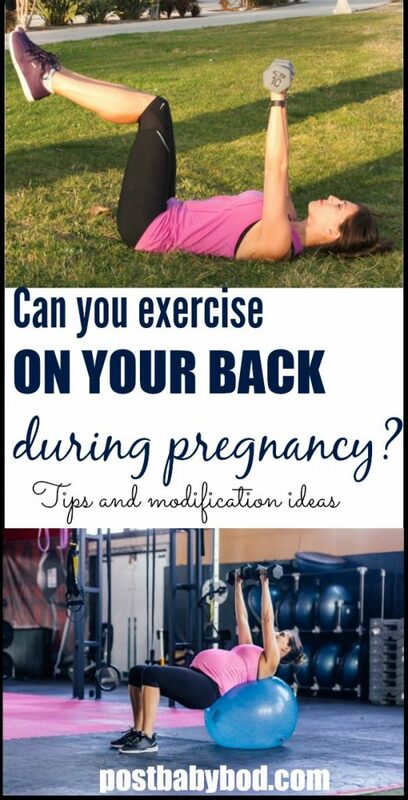 Some women are comfortable performing a short exercise set on their back during pregnancy because it feels completely fine, but to be on the safe side, it’s not recommended. Also, some women experience zero symptoms or feelings when the vein is compressed, so it’s smart to avoid the supine position and also avoid lying on your right side. I wouldn’t risk it, especially because the exercises will always be waiting and it’s such a short amount of time to dedicate yourself to growing a healthy baby. Also, there are ways to safely complete almost ALL exercises during your pregnancy. It just takes a little modification. Use an incline bench, so you aren’t flat on your back. You can also perform these with your upper back on a stability ball so there is no pressure on your mid to low back. This works well for triceps extension, lat pullovers, chest presses, and chest flyes. Any core work that you would usually perform on your back can be completed standing. As I mentioned before, avoid overtraining the obliques and check out this post for more exercises that are safe to complete during pregnancy. Bridges are safe (and a great leg, glute and core strengthener!). You just need to be very careful getting into the position. If it’s too tough for you to get onto the floor and roll from your side to push up, SKIP IT. Do some standing squats and leg raises instead. So tell me friends: did anyone else freak out when they woke up on their back? What’s your favorite pregnancy-friendly exercise? Mine is spinal balance. It’s a gentle way to challenge core stabilization the entire way through. I’ve actually been freaking out cause I keep waking up on my back. I’m currently 34 weeks pregnant. I was talking to my grandma about it and her words were so true. She goes this information wasn’t around when I had my 5 healthy kids so I wouldn’t keep yourself up stressing about it. Gotta love the older generations! I’m going to do the spinal balance when my conditioning class does their ab work tonight!! Thanks for this! I didn’t realize you could be compressing the vein without feeling it – I thought you always had symptoms, so I’ve been less concerned about about avoiding back-lying exercises this second time around. I was still limiting the amount of time I spent on my back, but not completely avoiding it. I think I’ll reconsider that approach for these last few months! Thank you for this post! I am 17 weeks and have been so nervous about doing my beloved bridges! I have been trying to keep my hips up and back off the ground during the rest period as much as possible.